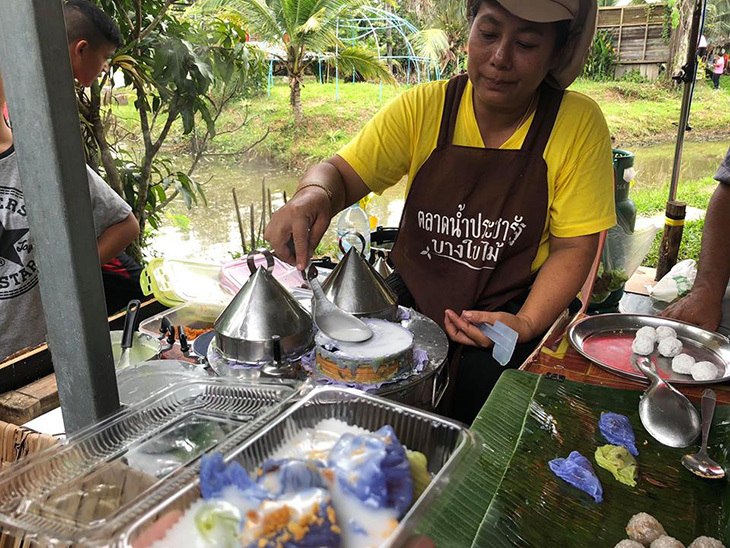 But what you can see here is the lady spreading a thin layer of rice flour – which may or may not be flavored – onto a piece of cotton, which is raised on a wide metal tube. There are three of these thingies. And below, is boiling water. 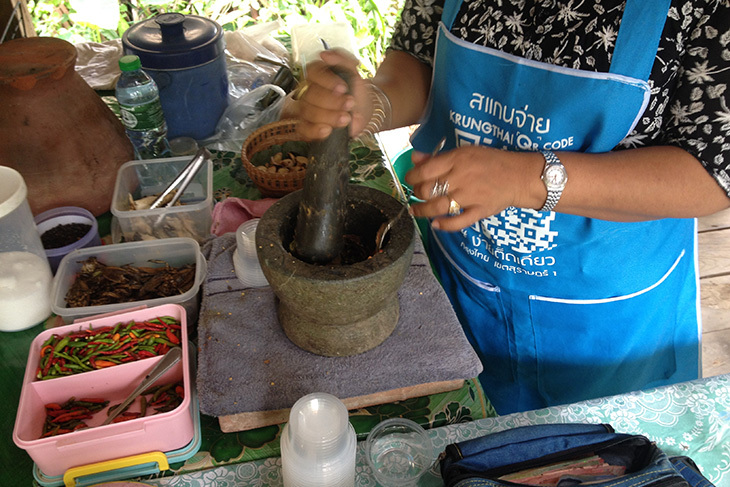 After the spreading of the flour, it’s covered with one of those conical hats, so the rice flour gets steamed, but not really cooked. 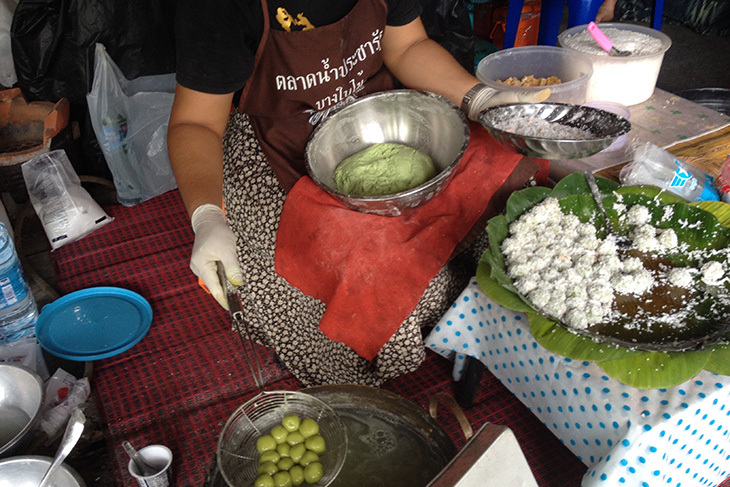 As I say, some of the rice flour is flavored, which is why there are blue-ish and green-ish finished ones in the picture. Anyhoo, once the flour has gone solid, a dollop of some kind of pasty mixture, made with peanuts or coconut, or whatever the cook fancies putting in there, is placed on top and then it’s loosely rolled-up to make the finished product. Well, something like warm snails coated in lighty-flavored wallpaper paste. And since I didn’t like the first one, I was persuaded to try a different flavor – and then spent the next thirty minutes trying to persuade (successfully) my stomach to keep them inside. These are made from solid palm sugar – what I would call Gula Melaka – mixed with flavored rice flour (probably the same stuff that’s used to coat the “snails”) and then boiled. Afterwards they’re dusted with coconut. 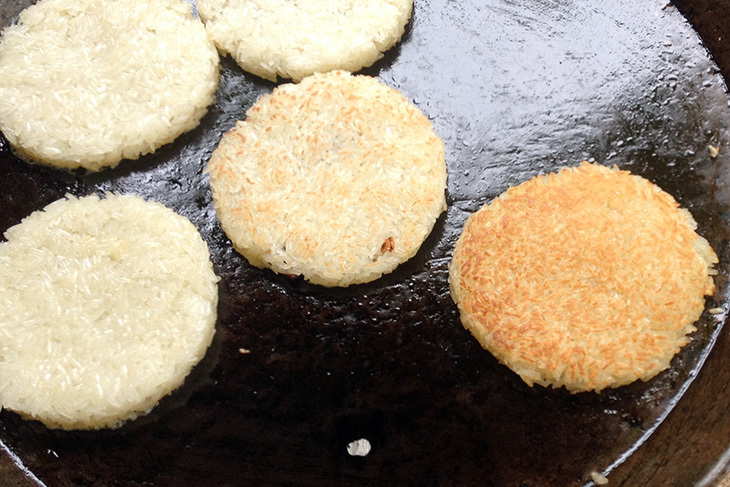 Sticky rice, molded into flat cakes and fried to make them crispy. Now, I always thought sticky rice was regular rice that had somehow been made sticky. But no, it’s a strain of rice. You can buy it raw in bags, just like you buy regular rice. Now, here’s something really yummy. Not! These beetles (Meng Daa) are found in rice padi fields. 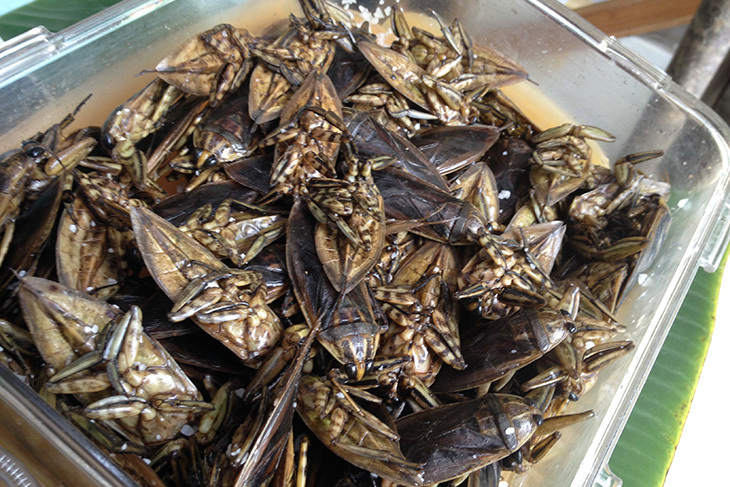 They’re pounded with chili, garlic and red onions – presumably in sufficient quantity that you can’t actually taste the beetles. And I didn’t hang around long enough to find out how you eat them. And there you have it. A quick tour of every imaginable kind of snack food, all of which looked utterly fascinating, but most of which I would only loosely describe as edible.